>Winter's when we go nuts for nuts! Enjoy them roasted (on an open fire...or in the oven), munched naked straight out of the shell, or baked with herbs and pulses to create a satisfying vegetarian alternative to traditional roast meats. Nuts are highly nutritious but eat them in any quantity and your wallet will take a fair whack. The solution, as with any premium produce, is to grow them yourself. Many of the kitchen gardeners I speak to about nuts are put off by the thought of growing them. They need lots of space, right? It's easy to see why this prejudice exists when you think of the grandeur of a mature sweet chestnut or the statuesque beauty of a walnut tree. But this isn't the complete picture. Some nuts, including hazelnuts, are perfectly suited to garden growing – and they'll put on quite a show while they're at it. Hazelnuts are the easiest nuts to grow – perfect for nervous would-be nutters! The hazelnut family Corylus includes the common hazel and closely related cobnuts and filberts. You can tell the difference between a hazel or cob and a filbert because the husk of the latter completely envelops the shell. 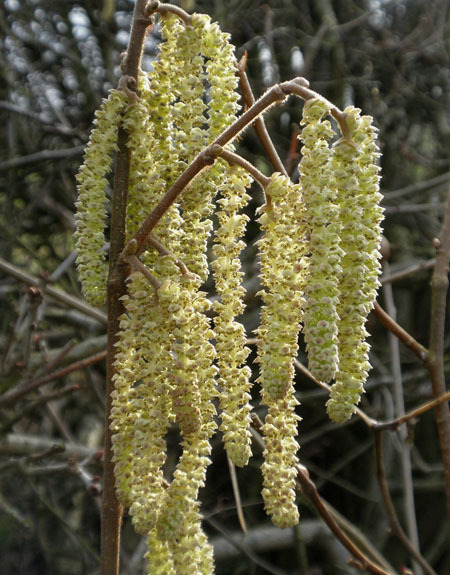 All members of the hazelnut family produce stunning dangling yellow catkins in late winter/early spring. These are the male parts of the plant that contain the pollen necessary for fertilising the female flowers and ensuring a good crop. Clouds of pollen waft forth on a windy day to pollinate the tiny female flowers held at the branch tips. It means that these wind-pollinated nuts actively prefer a site in the open. Furthermore, they are exceptionally hardy, putting up with both wet and cold winters. This makes them very useful plants for problem parts of the garden. Some hazels have additional beauty queen credentials in addition to the chandelier-like mass of spring catkins. The corkscrew hazel Corylus avellana 'Contorta' is so-named for its twisted, contorted stems, which are tailor-made for winter flower arrangements. A purple-leaved filbert Corylus maxima 'Purpurea' will add contrast in the garden and in the nut bowl with its purple-husked nuts. All hazelnuts, cobnuts and filberts will provide additional shelter and food for wildlife, particularly when grown as part of a hedgerow. Hazelnuts prefer soil that's well drained and fairly low in nutrients; overly rich soil gives plenty of leaf growth at the expense of flowers and nuts. The trees are technically self-fertile, but you will always get better results if you plant them in a group so that the pollen can drift from one hazelnut to the next, though other trees in the neighbourhood will also help with pollination. Don't worry – the word 'tree' is a technicality here; hazelnuts are generally grown as a bushy shrub and can be kept to a very manageable size by pruning. If you have the space, try planting a small orchard of hazelnuts, setting trees about 4m (15ft) apart to give them plenty of room. Create a matrix of different varieties to maximise pollination potential. Check the pollinator compatibility of the trees you want to grow to ensure a good match. Varieties need to be in flower at the same time to secure successful pollination. Caring for hazelnuts is straightforward. Prune them in winter to encourage an open bush. Do this by removing about a third of the oldest growth, cutting or carefully sawing the stems back to ground level. Thin out areas that are overcrowded to keep the centre light and airy. Cut back any crossing branches, but leave the young, twig-like growth, which bears most of the female flowers. Suckers are stems that grow directly from the roots of the plant, often at some distance from the main stem. These need to be dug out or pulled right off to prevent a mass of impenetrable stems. Keep on top of these suckers and they won't cause a headache later on. The nuts are ready to collect in autumn/fall as soon as the husks have yellowed. Pick them from the tree, or if they're perfectly ripe you may be able to shake them off onto a tarpaulin or sheet. Store you cache of nuts in a dry, airy place within crates, nets, cloth bags or slatted boxes. Squirrels are natural acrobats. And they're very determined! How to keep your nuts safe from their marauding grasp is a tricky one. Due to the way hazelnuts are grown, there's little you can do to keep squirrels off your trees, other than enclose them in a wire mesh-clad fruit cage, which seems a bit excessive. The only practical answer is eagle-eyed vigilance. Should squirrels take more than their fair share then get out there and pick them at once. They may be slightly under-ripe but the squirrels wouldn't be after them if they didn't think they were ready to eat. Dry your nuts by spreading them out onto trays, turning them every few days for an even result. Dry them indoors in a warm place for two to three weeks. Once they are dry you can scrape away the papery husks and store, either in or out of their shells. I would love to hear from other gardeners who grow hazelnuts, cobnuts or filberts – or indeed any nuts. Do you have any tips for squirrel-proofing your crop? And how do you use them in the kitchen? Share your comments below. "Good article but what zones are good/best for these to grow?" "Hi Kelly. They grow in USDA zones 4 through to 8. If you are in the coldest zone, then go for American varieties of hazelnut, which tend to be hardier. Let us know how you get on." "There are two common native varieties of Hazel trees in the U.S. They are not self-fertile. One type is "American" and one is "Beaked." The husk on the nuts of the latter completely envelopes the shell; it kind of looks like a beak. Some hybrids are considered sort of self-fertile but having a second variety or compatible planted-from-seed tree nearby is always better for the harvest. Store-bought Hazelnuts are typically a European variety and are larger than the native nuts, but most folk think the native nuts taste the best." "Hi Hobart. Many thanks for sharing this insight - it's appreciated from someone gardening here in the UK." "I would like to grow hazelnuts in wisconsin. where would I get the seed or plant?" "Hi Cindy. I would try at your local nursery. Failing that, try doing a search online for suitable stockists in your area. Hazelnuts are fairly widespread, so I'm sure there will be someone local to you that sells them." "www.twowests.co.uk/category/fruit-and-vegetable-cages have saved my garden this year! I was struggling a lot with the wildlife (although I always make sure they're not neglected) and the large fruit cages have saved my raspberries! So even though it can seem like the last resort to get a fruit cage, I'm so glad I did. Click the link to check them out!" "I have found many Hazel trees/bushes growing wild in OR and WA (US), usually in the vicinity of a stream. The problem (discounting any legal issues) with digging them up for transplanting is that they develop a significant tap-root fairly young, so a healthy-looking 3-footer (meter), or taller, specimen will probably break its tap-root being removed from its site. Opinions vary as to how well such a plant can recover. I just started doing this last Fall (moving them from the woods on my land) and mine mostly look good, but I'm told that with a broken tap-root they may grow and yet not fruit. We'll see. One nice thing about scouting for wild trees is that you can at least go there (a little before the other wildlife) and get a harvest. Plus, the transplants might fruit! Still have to have more than one, though." "I've recently planted a purple contorted hazel but my two dogs barged into it and broke off one of the slender branches about 20cm long and in leaf bud. It came away with a heel on it so I've put it into a small pot, in a warmish place in the hope it might take root. Any advice on the probability of that happening?" "Sandy, again from my limited experience, most nut trees seem to greatly utilize a tap root, which grows straight down for quite a ways. In a pot that root will circle around and around. I believe it is for that reason that nut trees aren't permanently planted containers. I'm not sure if you are trying to get a branch to root. You can investigate that but though 'layering' with live branches is a common way to propagate hazel trees, rooting from cuttings is not. Here is a link to special techniques for growing nut tree seedlings. http://northernpecans.blogspot.com/2013/06/growing-pecan-seedlings-in-containers.html"
"The suckers referred to are also known as 'free trees.' Do some research to find out the best time to do this but at some point these trees are sufficiently independent of the mother tree and not yet overly burdened with their own long taproot, and can be moved to a new location. I believe they are clones and so are not good additional pollinators for the parent tree but they are viable re: the rest of the community." "Hi, we recently inherited a twisted hazel ... The previous owners of the house planted it. It's about 5 to 6 foot tall so I'm guessing not a young tree. I love the tree with its gnarled branches..and it looks really healthy. The catkins appear but to this day I have never seen any flowers appear...which therefor means no nuts :( it's been over a year so given the tree a full cycle to see what happens season to season. Everywhere I read articles claim even the twisted hazel should produce both male catkins and female flowers...is it possible we have a male only tree? Any advice appreciated. We haven't pruned it other than removing any straight shoots that appear...I read that somewhere. Really want it to produce some nuts! Thanks for any tips." "Hi Alex. Male and female catkins/flowers are definitely found on the same plant. They perform better when there are more than one tree in the immediate locality - this helps with pollination. So it could simply be that the hazel needs another hazel nearby to boost pollination. The female flowers are very tiny, so it may be that you simply haven't spotted them! They are out at the same time as the dangling male catkins." "I took over my brother's allotment at the beginning of this year and while not a newbie at growing my own produce I found myself with two Corkscrew Hazelnut trees, one is a fully developed specimen about 7ft x 7ft and wasn't sure about when to harvest - so was glad to read your column on the subject. " "It would be better for you to get an allotment down the correct channels Carol. Waiting list and own name. The Allotment Society usually dont approve of someone taking over a family members allotment and its not in the rent agreement." "Hi, greetings from Serbia.I was wondered if you could help me with something. I have done the analysis of the soil but i dont know if it needs to be improved. Could I send you the analysis so you coukd tell me what needs to be done, and wich tipe of huzelnut I should plant. Thank you"
"Hi Nikola. Unfortunately we can't offer that service. Most hazelnuts aren't too fussy about soil conditions though. They prefer well-drained soil, but will also cope with wet and cold winters. I would ask about hazelnuts at a local plant nursery, as they will be able to advise on the best varieties for your area." "What is the best time of year to plant hazelnut seedlings? I'm in a "Zone 5" area, and will just be growing a few backyard trees. Thanks!" "Hi Karen. Zone 5 can get pretty cold, so to stay safe I'd be inclined to plant seedlings at the very start of spring, just before the buds break into leaf." "Our hazelnut trees produce well but there are many empty shells (assume not pollinated). Does anyone know of a way to sort the good from the empty shells without cracking them all open? We have tried floating them. All the sinkers are good but some of the floaters are also good!" "Hi Margaret. I've not heard of this happening before and would love to hear if anyone else has experienced this and has a solution to sorting the filled shells from the empty ones." "HI where i can find information about setting up hazelnut farm step by step ? ?Thank you"
"Shoot the squirrels and eat them. Free protein and delicious to boot. Just dust them with flour, then fry them in a little bacon grease. Use the pan drippings to make Squirrel Gravy and bake some biscuits. Man, that's good eating !!" "Can you just plant hazelnuts in shell bought at a grocery store?" "Hi Alan. Hazelnuts can, in theory, grow new hazelnut plants - that's how they of course grow in the wild. However, the process can be quite long-winded and growing from store-bought nuts may not work as the nuts may have been treated or stored in a way that renders them useless for this purpose. If you're determined, however, you can collect your own nuts and try these. This article explains how to do it: http://homeguides.sfgate.com/grow-hazelnuts-seeds-49350.html "
"Hello, I have just moved into a house with a Hazelnut tree. It is overgrown and I was told only very rarely produces nuts. Is it possible for me to make it produce again? I was told if I pruned about 1/3 of it it would begin to produce again. I have never grown a Hazelnut tree and need help!" "Hi Theresa. How you prune really depends on the size and shape of the tree. If the hazelnut is badly cluttered, then yes, do go ahead and prune out some of the branches, removing any badly positioned, shaped or crossing stems to leave a cleaner, clearer crown. Hazel is pretty vigorous, so pruning will encourage lots of new growth, which is where the nuts will eventually come from. Some hazelnuts are pruned to produce a coppice or pollard - i.e. lots and lots of vertical stems from the base or a stubby trunk. You could cut all of these stems right down to the ground/stump at once, which would encourage lots more vertical stems (these are great for cutting as vertical supports for climbing beans etc.). Is your hazelnut a more typical tree form, or lots and lots of shoots all emerging from the ground/a single trunk?" "Thank you for your response! I think I may just cut it down to the ground and get a fresh start. The hazel is the kind that has lots of shoots coming from the ground. " "It sounds like it's been coppiced in the past, which means it is cut back to the ground regularly to produce masses of new shoots. Good luck with it - less us know how you get on." "I am planning on making a espalier fence along my property line. I was wondering if hazelnuts would be compatible with that. I'd love to grow hazelnuts, but I don't have a lot of space in my yard for large bushes." "Hi Heidi. I'm afraid that hazelnuts wouldn't really be suitable for growing as an espalier, because of their vigorous growing habit. " "This comming spring I'm planning on cutting down a large evergreen tree that is leaning badly. I would like to plant a hazelnut trees on on each corner of our front lawn. I live in the city and the sewer system is only a few feet away of where I wish to plant them. Is this a problem? Will the roots seek out the water source and destroy the sewer tiles? Randy on Friday December 23 2016"
"Hi Randy. It's hard to say really. The sewer system pipes should be robust enough to withstand roots, particularly as there are so many street trees etc. And while hazelnuts are good growers, I wouldn't imagine their root systems would be that invasive. So I would be inclined to go with it, especially if, as you say, the sewer system is two or three feet away, which would allow the roots of the hazelnut a four to six foot diameter spread - more than enough." "do the hazelnuts need to be frozzen to start to grow"
"Hi Stephen. Hazelnuts are best sown fresh - i.e. in late summer, using fresh, ripe hazelnuts picked from the bush. They are then sown into pots before transferring to a cool (but not frosty) place - usually a refrigerator. They need to stay here for three to four months. The cold stimulates the nuts to germinate once they are removed from the cold at the end of this period. They can then be moved to a warm place to germinate. The potting soil will need to be kept moist throughout this time. An easier way to propagate hazelnuts is by mound layering, though this of course depends on you having a hazelnut in the garden in the first place. If not, growing from (fresh!) hazelnuts could be a fun and very rewarding project." "How can I encourage flowers on my hazelnuts? I have 9 bushes some of them are 20 years old,but I never get any nuts! I get lots of catkins but no flowers. I tried breaking back the limbs one year but maybe I did it at the wrong time? Any suggestions? Thanks "
"Hi Charlie. The catkins are the male flowers, and the female ones are very small. It sounds like your hazelnuts are flowering fine - the problem is they're not producing any nuts. Are the nine hazelnut bushes close to each other? If they are far apart then they won't be cross-pollinating. Hazelnuts produce far more nuts if they are grown closer together and the pollen from one tree can fertilise another. Trees should be no more than about 20 metres (60 feet) apart. Also, if the tree is producing lots of suckers - shoots emerging from the base of the trunk - then these should be cut out to leave just the main, central stem. Lots of suckers means fewer nuts, so it is worth keeping on top of these. " "I found a sprouted hazelnut in my composting bark pile. Transferred to a gallon pot with potting soil. It is about 6 inches tall with good roots attached. I live in zone 8 in Southern Oregon. Hoping to have a hazelnut tree someday. Not sure of any others in the neighborhood. Probably from my friendly blue jay. He brings me lots of other surprises. " "What a lovely surprise! I hope it continues to grow and thrive for you." "I would love to have squirrels come to visit me! I will plant hazelnuts, then!" "Hi Ben, I have one mature hazel nut bush on my property and have planted six more of different types for cross pollination. Can I do scion grafting of the cross pollinators to each other to improve pollination? " "Hi Mark. Having a number of different hazelnuts in the vicinity should be enough to ensure adequate cross pollination. Grafting the different varieties onto different plants would be a lot of hard work with no guarantee of success. As long as the trees are within reasonably close proximity - so that the pollen can travel between them - you're fine." "I have two hazelnut trees that are probably ten years old. I've never seen them flower and we've never gotten any fruit. I haven't pruned them because they're still so small. Do you have any idea why this might happen, or can you direct me to other places that might have an answer?" "I have to confess Lauren that's a bit of a mystery. They should be producing nuts by now. They do need a sunny or at least part-sunny position, so if they are growing in a highly shaded area this could be your problem." "No, they're in full sun. Both are currently about four to five feet tall and have never suckered. They're fifteen feet apart. Some things just don't thrive in my yard. I may pull them and plant something else. Thanks for your response!" "That's disappointing Lauren, particularly when they've put on so much growth by now. I hope that you'll have better luck with what you choose to replace them." "My hazelnut bushes are beautiful, but they never produce any flowers, any pollinating dangling things, and there has never been a nut on either bush. We have plenty of trees in our neighborhood, my bushes are about 10 feet apart and we have wonderful windy days here, but never a hazelnut on the bushes. I love hazelnuts, but I must be doing something very wrong." "Hi Janie. That is a bit of a mystery, as they should definitely be producing flowers towards the end of each winter. Could it be that the trees are just still a but young and haven't established enough yet to produce flowers? " "If you have catkins but no nuts, you might try hand-pollinating early next spring. Look online for a picture of the female hazelnut flowers so you know what to look for: they are tiny red threads coming from apparent buds all along the length of the branches. Start looking in late winter as they are out very early spring. Then find an expanded yellow-green fat catkin from another hazel bush, and dab it over the flowers. You can also pick and hang a few catkins high in other bushes. You won't see the result of fertilization until many months later. I tried it in 2017 and it worked! I finally got nuts from the large vigorous bush." "Hi Chris. That's brilliant - thanks so much for your suggestion. This would be very useful, I imagine, during relatively still conditions too, to help the pollen get to exactly where it's needed." "Well, when I bought the bushes they were supposed to be 2-years of age. I have now had them in my front yard for at least 5 years and nothing but leaves. I have never seen the red flowers on my bushes that Chris wrote about. Googled images of female hazelnut bush flowers and I have definitely not seen any of the beautiful flowers. Starting to wonder if I even have Hazelnut bushes now. I will be snipping a bit off a branch and visiting my local nursery to see if I have planted hazelnuts. Thanks for your help! I'll let you know what I find out." "Please do Janie. It sounds like you may have been sold the wrong plant!" "Hi Ben, I have 4 hazel trees. Planted about 3 years ago. Lots of hazelnuts last year, although a bit small. We didn’t prune them so this year they shot up.... but no hazelnuts. Any idea why? I’m in Ireland so wet soil Perry"
"Hi Perry. It's difficult to know what the cause could be. Sometimes fruit and nut trees produce less fruit/nuts after a particularly heavy crop the year before. This is called biennial bearing, and it could be what's happening here. Regular pruning is a good way to keep trees vigorous, while increasing yields." "Aloha, I would love to add Hazelnut trees to my Tree farm. I have avocados and citrus trees. I also have my own "doorstep herb garden" its amazing at what I can grow here the land is great for growing trees, veggies and herbs. " "The Arbor Day organization has a Hazelnut Project where you can join in and return results of your trees to the organization to further the development of new varieties. You simply go to the site at www.arborday.org and then click on TREES in the top menu. When you get to that page type in Hazelnut and Enter. You will be shown a page where you can see two varieties. Click on either variety for more info and pricing. Pricing is cheaper if you join the Arbor Day organization, however there is no requirement to do so. But, if you are going to buy more than one tree joining makes sense for the savings.With that said, this site gives much more information about planting, care, feeding, and harvesting than the Arbor Day site, by far exceeding the information supplied when buying the plants at Arobor Day.In fact, I found this site looking for ways to get more growth out of my plants and it looks like I don't really need to do anything other than keeping it watered." "Hi Jesse. Thanks for the information and I'm really pleased the article has proved useful. " "It is first week of March I live in Langley B.C. I have two old nut trees they are already budded Can I still prone them now thinking of planting a orchard"
"A year ago, in a response here, you wrote "Lots of suckers means fewer nuts, so it is worth keeping on top of these." I've been promoting commercial hazelnut production by coppicing in hedgerows, but only one grower here in Oregon has tried my high-density, hedgerow concept (as opposed to planting a traditional orchard). Your comment seems to indicate that you don't think hazel will produce nuts well from suckers. Why is this? " "I received my Hazelnut - trees? - from the Arbor Day Hazelnut Project and planted those last year. They seem to have rooted well and are between 6 in. and 10 in. above the ground. SO, how much growth should I expect from them this coming year under average North Central Indiana weather? After seeing some of the photos on this site I'm wondering how long it will take before my plants start producing also?" "Hi Rick. You should be able to continue pruning at any time before the plants start back into growth. I imagine in BC you're probably still technically in winter, unless it's been very mild lately, so should be able to safely prune." "Hi Kevin. The removal of suckers is more about keeping traditional 'tree' grown hazelnuts tidy and maintaining distinct, separate plants that don't grow into each other as a thicket of stems. However, you clearly seem to be enjoying success with your technique, after all wild hedgerows will still yield nuts. It's interesting to learn of your technique - please do give a little more detail if you're able to, as I'm sure other hazelnuts enthusiasts would be keen to learn more on this." "Hi Jesse. It's hard to predict how much growth a hazelnut will put on in a year, because it varies so much with soil conditions and climate. I would expect growth of at least a couple of feet, but possibly more. Hazelnut tend to begin cropping within two to five years of planting." "Ben, Thanks for your response. I've been promoting growing hazelnuts in hedgerows for at least 10 years, but I know of only one commercial grower trialing the system. I promote this because hazelnuts are really understory shrubs, not really trees. As a result, our orchards here in the Willamette Valley are subject to lots of limb breakage. It seems foolish to spend years building a tree "scaffold" on which to grow nuts in the top 25% of the tree. Most other tree fruits (and some nuts), have moved to high-density planting in order to improve ROI. Sometimes these high-density orchards (as in apples and cherries) require trellising. But hazelnuts do well without a trellis and willingly send up lots of suckers to populate what will become a coppice over time. Since no one really has years of experience with this model (it's really theoretical), most likely some thinning of suckers would be required. And I estimate once every 5-7 years, the grower would saw off all the suckers on one side of the coppice (alternating timing to preserve production from the coppice). This regular removal of wood should eliminate or vastly reduce problems with EFB (the most damaging problem here in Oregon), thus we could grow the older, more productive varieties (with larger nuts) that are so susceptible to EFB, rather than the newer (less proven) varieties. Perhaps the best part of the hedgerow concept would be the improved interception of light in a vertical canopy (as opposed to the essentially horizontal approach of the traditional orchard). This would also allow the grower to have a healthy cover crop between the hedgerows, as opposed to the herbicided orchard floor that is the norm now. I could go on with the benefits of this approach, but I'll stop now. It just seems to be a superior approach to growing hazelnuts. " "Hi Kevin. This sounds like a genuinely interesting and likely successful way of growing hazelnuts. Certainly the way you describe it does appear to make good sense. It's great to be trialing 'alternative' methods like this, though of course coppicing is a centuries-old technique, particularly over here in Britain. Thanks so much for sharing this information. We need to be trying new (often old!) ways of doing things to boost productivity without upping inputs such as herbicides and pesticides." "Hi Ben great source of information on here thanks. I want to plant 4 or 5 trees to create a screen from a neighbours house which looks onto our garden. My question is which variety of cobnut or filbert would reach an eventual height of 6m or would I need to grow common hazel to achieve this? Would be great to have a good nut producing screen. Many thanks in advance Matt "
"Hi Matt. Both cobnuts and filberts, and hazels, which are all essentially the same type of tree, will grow to eventually reach around 5m (15ft) in height, so perhaps a little shy of the 6m you're after. To enable them to reach this height they need to be spaced a similar distance apart. As you say, they would make a lovely productive screen." "Ben, Thanks again for sustaining this dialogue. I did deduce my hedgerow hazelnut production concept from the "centuries-old" British method of growing hazel from coppices for post, poles and firewood. I've read postulations that coppiced hazelnuts may have been the earliest form of "agriculture" during the Neolithic Period in Britain. BTW, to the previous post, we have filbert (hazelnut) trees in old orchards on rich, loamy, high OM soils here in Oregon that will reach 15m! But that's no longer encouraged to favor more manageable orchards. " "Ben, I wanted to give you an update on the non-bearing hazelnuts. I decided to move them to another area of the yard, thinking the problem might be the soil, and when I dug down to get them out I discovered that the roots were growing horizontal on top of a solid layer of rocks. The roots were no more than twelve inches deep. Drought stress is increased with roots that shallow. They seem to be doing fine in their new spots, we'll see if it makes a difference." "Hi Kevin. Thanks for your comment and further detail of your growing methods. I'm amazed by your 15m-tall hazelnuts!" "Hi Lauren. So pleased your hazelnuts seem to be happier now. The very shallow soil may well have been the problem. I hope they now flourish for you." "My hazelnuts have the catskins and red flowers...FINALLY!! They are the right bushes!! Going on year six and they were 2 when I bought them. Turns out you can successfully grow hazelnuts in Colorado!! " "That's great news Janie - congratulations on getting them to flower. Hopefully lots and lots of hazelnuts will follow!" "I have three Hazelnut trees to plant and they are about 10-12 foot apart. Two are about 1 ft tall and the other is about 3 1/2 ft tall. It is good soil well drained and I expect those to do well. My question is, "Would planting Rhubarb be detrimental to either the Hazelnut OR the Rhubarb if I plant two Rhubarb plants between the Hazelnut trees?"" "No, I think both would be fine. The rhubarb would create a nice ground-layer of vegetation and would be fine in the dappled shade. And I don't think the hazelnuts would be any worse off for it." "Hello Ben. Many thanks for this great interactive site that you have kept going all these years! I am an independent agronomist in Swaziland, southern Africa. Just yesterday an Italian walked into my office, and told me about some hazelnuts (three bushes, different ages) growing in the yard of a convent in our capital, Mbabane. According to the nuns they never had any fruit from them. I will go have a look tomorrow and will come back with a sitrep, but one question I'd like to ask to start off. We may be a little too warm here, although our climate is subtropical, not tropical. Do hazels need chilling in winter in order to induce flowering, and if so, how much? Mbabane will typically get a dozen or so nights with ground frost each winter (it is in the hills), but temperature will just as happily shoot up into the low 20s (C) during the day. I know that high daytime temperatures in some plants can negate any night chilling. How is this with hazels?" "Hi Harry. Thanks for the kind words about the website - very much a team effort among us here. We're proud we are now one of the most comprehensive sources of gardening advice out there! It's great to have readers from all over, including Swaziland, which is somewhere that's always intrigued me. In answer to your question, I'm afraid I am not entirely sure about the vernilization (chilling) period of hazels. My intuition would be that it does require a certain chilling period owing to it's typically temperate climate distribution. The fact you have occasional frosts does bode well for its requirement, though as you suggest, I'm not sure how warm days would influence night-time chilling. So in short, I can't answer your question. I have had a bit of a trawl online to try and find an answer, but have drawn a blank. It may be worth finding out of the bushes flower and, if they do, if much pollen is produced. The pollen relies on wafts of wind to distribute it, so if it's very still this may be the reason. Or it could be that it is too warm and the pollen is potentially rendered ineffective? Sorry I can't be of more help. Do let me know if you manage to find out the reason behind their lack of fruiting." "Hello again Ben. Well, things are looking interesting. It turned out that the nuns don't have three bushes, just one. So we can already guess the first reason for the lack of fruits: no cross-pollination. If they flower at all I still don't know, there was no-one around to ask when I was there. But the second problem makes that a bit unlikely: the bush was standing under some pretty big trees. It could still have received enough light from the sides, but definitely not optimal. I found some Dutch research results that showed that flower initiation in hazels takes place under the influence of light, not cold. In the northern hemisphere flowers are initiated in June or July, depending on variety. The female ones, that is, the males are initiated from mid May already. The actual flowering does not seem to be triggered in a direct way by weather factors, although for the same variety in a generally warm climate flowering does take place earlier than in a cold one. Lastly, the bush was not too well tended, it was planted as part of a kind of hedge around the actual vegetable garden. Because the garden is on a slope and is being kept excessively clean, there was a fair amount of erosion on the lower side of the bush, and practically no humus layer. This must influence the vigour, and might result in short shoots. This is another factor influencing flowering: in order to flower properly, last year's shoot must be roughly between 15 and 45 cm long. Not longer and not shorter. It should also have grown from a vegetative bud, as opposed to a mixed one (that is, a bud that produced both leaves and fruits on its shoot). The nuts seem to suppress initiation of female flowers on the same shoot. So, the mystery is probably solved for this bush. But we still are looking for good location to plant hazelnuts here. The international trade is worried about political developments in Turkey (70% of the word's hazelnut production!!) so there is a fair amount of interest in risk-spreading...."
"Hi Harry. Thanks for the update. Glad the mystery is solved. I think hazelnuts are a great thing to grow generally, and the stems offer a great local alternative to bamboo canes. Good luck with your project - I hope you all get some hazelnuts to enjoy soon." "Hello, I am new to your blog. I have been growing the varieties; 'Dorris' , 'Jefferson', and 'Theta' for one year in containers. They are WEEDS, I can not believe how fast they grow...I also have some native Corylus americana that are a couple years older. I have sandy soil; (I sit on an old beech head of lake Erie, west of Toledo, Ohio.) I want to clarify some things... Is my soil OK?, I should space these varieties 12-15 feet apart? I should OR should Not prune suckers? I hope to start a small 'orchard' of edibles, IE Filberts, Paw Paws, blueberries, 'super fruit' honeysuckle,etc. Thanks for your input!" "Hi Chris. Your small orchard of edibles sounds like a delicious idea - I hope it goes well for you. 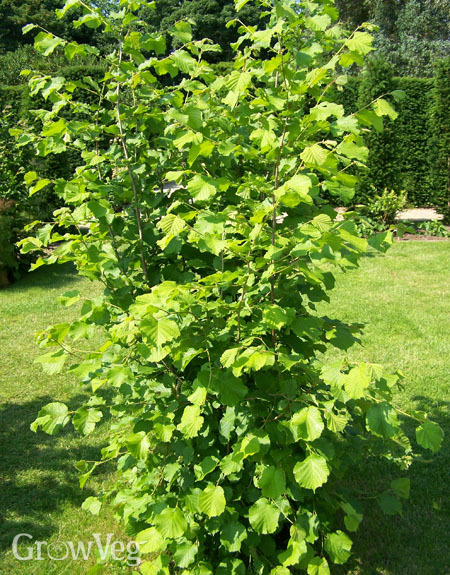 Hazels prefer a light, sandy soil, so what you have there sounds ideal. In any case they aren't terribly fussy when it comes to soil type. Yes, space hazelnuts about 15ft apart. It sounds like a lot - and you could probably plant a little closer - but it will give the best results, with plenty of airflow between plants and lots of light to speed ripening of the nuts. You should remove suckers, which grow away from the centre of the plant, to stop your hazels becoming a thicket of stems, which would make further pruning, care and harvesting very difficult. " "Hi there guys, i'm trying to plant a field of about 1 hectar with hazelnut trees. Will i need more than 2 compatible species for pollination? Also, where should the polleniser trees be placed? The overall layout will be 4x4 meters. Cheers"
"The trees are self-fertile, which means they can pollinate themselves. The big factor in aiding pollination is to ensure you plant more than one tree, so the pollen between trees can blow across each other to improve the pollination rate. What you have planned will ensure this. You only need one variety of tree. There is no need for multiple varieties or compatible species." "Hi from Victoria, Australia I have three bushes which were 5ft tall when we acquired our property 20 years ago. They are about 8ft apart. I have pruned them to keep them at about 5/6 ft. Recently I have been advised that they are hazelnut bushes but I have never seen any nuts. We are just coming out of a cold wet winter (there have been a few frosts) and the bushes have no leaves. I have just had a look at the bushes and have seen the small red flowers on the buds. However there are no catkins except for a couple of dried up brown ones that were left on the bushes after leaf drop last Autumn. Seems to me that male and female flowers occur at different times of the year. Any thoughts/suggestions?" "Hi Trevor. I'm afraid I can't offer any suggestions for this. The male and female flowers should occur at the same time, to enable pollination to occur successfully. Your bushes are probably close enough to enable good cross-pollination too. Sorry I can't be of more help on this one." "Have a hazelnut tree produces a lot of nuts but they are empty inside Help ..I have only one tree is that my problem . Louie"
"SO, we're approaching colder weather and eventually Winter!! Brrr! HOW do I protect my Hazel Nut plants during winter? I cannot call them trees yet as they did not grow much this season, but, I don't want frost and freezing to kill them off either. Some are still under one foot tall. Thanks!" "Hi Louis. It could be, as you suggest, that there's only one hazel tree. They can self-pollinate but always do better if there's more than one. If it's very sheltered it could be that the pollen isn't blowing around sufficiently for pollination either - though I think this is probably unlikely." "Hi Jesse. Hazel trees are very hardy, so you don't need to protect them from the frost. They'll be just fine!" "I have spent a great deal of time in Asti, Italy where hazelnuts are native. It has inspired me to plant them back home in California. My only concern is the persistent gopher problem I have. Is it possible to start the trees in gopher cages (as I do nearly everything else). I want to give them a chance to establish themselves "
"Hi Natalie. Yes, give the trees any protection you can until they have got well underway and are beginning to establish. I'm not familiar with the persistence, ingenuity or strength of gophers, but if they are particularly active you may like to consider a larger but equally sturdy cage until the plants are strong enough to fend for themselves. That said, hazel is very tough and grows really fast, so you should hopefully free of any nightmare gopher-related scenarios. Good luck!" "Hi, I’m Cassidy and I thought of a way do the squirrels to not get to the hazelnuts. You could but the plant in a pot in a greenhouse, and put in some fans so the pollen could be able to reach the female flowers. I hope this works!!" "Thanks for the suggestion Cassidy. I think hazelnuts are best grown outdoors, where they can get enough cold during the winter. Netting could work to protect smaller trees. Then when the tree has reached maturity and is cropping well, hopefully there would be enough nuts for both squirrels and gardener." "This may or may not help with your little rodents. I did this to keep deer away from my fruit trees. One person told me to chip away at a cake of "Irish Spring" soap around my trees for protection. Another person told me to collect my own urine in a gallon jar and put that around the trees. I did both. CAUTION: IF you collect the urine make sure the jar is tightly sealed after every input. By the time the jar gets filled the odor is very string." "Thanks for sharing these tips Jesse. Urine is surprisingly useful - it can also be sprayed on trees as a winter wash (when the leaves are absent, in winter). Apparently it helps to control overwintering pests." "Hello Ben, Thank you for regularly checking and replying to your post; it is most helpful. I am interested in forming a short allee of hazel. Perhaps by planting two opposing rows of three trees more closely spaced than would be ideal if planted solely for nut production, and with three meters separating the rows? Their propensity to sucker and bushy habit would seem that they might form a dense informal allee. Previously I have grown hazels in colder-winter areas of the US, now I am gardening in the more moderate USDA zone 9A of the French Charente Maritime. I see plants sold here at nurseries in Autumn so assume these may be varieties more successfully adapted to a cool, but not cold, winter. Even with reduced nut production I imagine the lovely crenulated foliage of summer and attractive late winter catkins would make a lovely addition to the garden. Thoughts or suggestions would be most welcome. Thank you." "Hi JB. I say go for it, definitely! The varieties sold locally would be the best to choose, as obviously they'll be the likeliest to thrive in your climate. A pleasingly symmetrical, though slightly loose-at-the-edges alley of hazel would look sublime, especially in late winter when the catkins are out. What a fantastic idea!" "Hi Benedict, as an expat living with her Serbian husband in the foothills of the Valjevo mountains, part of the Dolomite range, we live on very poor and rocky land. Our little farm has a grove of hazelnuts and I am amazed at how resilient they can be. We experience temperatures ranging in summer from 40C to below -28C and extreme drought to torrential rainstorms and deep snow during the seasons, however, the hazelnuts withstands the worst of it to bounce back and produce lots of nuts. This is just as well because we have lots of squirrels who take their share of both our walnuts and hazels. The biggest competitors by far are the rescue dogs we have. The battle commences when we sit down to shell our regular harvest of 5 to 6 kg per bush which equates to around 30 kg a year, The squirrels probably take a further 2 or 3 kg overall. The dogs help themselves from the ground or sit around and become a nuisance when we sit down to shell some at regular intervals during Winter. Some years nature takes a break and instead of the usual 40 kg of walnuts from our 4 trees we only get around 10kg and the same with the hazelnuts, this year for the first time in 20 years we didn't harvest any hazel at all only walnuts. This didn't coincide with any particular weather event. We know we will lose the walnuts if late frosts come because the walnut is very susceptible to this. We never feed the bushes and generally speaking the land is very poor but they seem to thrive regardless Save for a few damaged branches we rarely prune them but this year will have to because some of the older branches look as if they will soon break. This wonderful bounty of nuts is so easy to grow and yet in UK we always cut them back regarding them as a nuisance! Nice to read all these comments from all over the World, thank you so much"
"How lovely to read your experiences of hazelnuts and walnuts Amanda - thanks for taking the time to share. 30kg of hazelnuts is incredible! What a real treat! Sorry to hear the hazelnuts took a break this year. Hopefully - and probably very likely - they will come back next year in branch-straining abundance! It's very interesting to read that they thrive on relatively poor soil and in such incredible extremes of weather. It just goes to show what incredibly hardy, resilient plants they are. Walnuts? You've tempted me to gently warm a few to toss into my lunchtime salad. Very good for the brain I've read too. Just what's needed when I have another GrowVeg blog article to write this afternoon! Keep up the good work over in Serbia. :-)"
"Brilliant article and posts - so generous of you sharing this information Ben, and of all the contributors too. We farm Pecans very successfully in the Kwa-Zulu Natal region of South Africa but I am now really keen to try Hazelnuts. we have a hot, not very humid summer (can reach 40'C) but winters are generally mild (and definitely becoming milder, sadly) and dry with occasional frosts. My question was going to be which climate the nuts need but after reading Amanda's Serbian experience, it would seem that our climate would suffice. Is there a website you could recommend for best planting practices....unless you could provide the info? What diseases are associated with Hazelnuts? Thanks again for your great blog." "Hi Felicity. Yes, hazelnuts are incredibly hardy and very versatile. The main problems associated with hazelnuts are rodents and birds, which can sometimes snap up the nuts before you can, though once they are well established there should be plenty of nuts for everyone, including the local wildlife! I'm not familiar with a specific website devoted to growing hazelnuts, so an additional online search may be the best option for very specific advice on growing them, particularly commercially. Hopefully our article will have offered a solid starting point, but please do let me know if you have any particular questions and I'll of course do my best to help."